Diary of a Keyboard Activist: Bloody Prince Phillip! 24 July 2000: Bloody Prince Phillip! I got up at a decent hour and M drove me to the local Harrogate station. I had to take a local train to York. En route I continued to read Christopher and His Kind, and I loved the scenery out the window. At one point we crossed a river on a high bridge, and as we entered Knaresborough, I saw a tourist's dream--houses painted with harlequin chekerboards and neat slate roofs. It almost seemed like the houses were like this for centuries. When I got to York I purchased my ticket to London from the GNER agent. GNER runs a much better train line than Virgin. I decided to get back to London early, so I bought a ticket for the next train, and devoted the next 50 minutes to visiting the Minster. It's just an eight-minute walk from the train station. It's a lovely walk; you pass the old walls and cross a lovely bridge, and the main street to the Minster gives a wonderful view of the cathedral. When I got to the Minster it was closed! 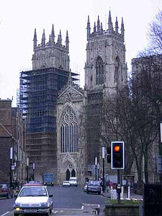 According to the volunteer guides, the Minster is closed for three days due to an impending visit from The Queen and Prince Phillip. Bloody hell. So I trek back through the streets of Eboricam, back to the train station, which is a grand old Victorian affair of the 19th Century. When I told Cousin B all this, he said, "It's got to be the quickest trip to York on record!" So I hopped onto the next train. The GNER trains are fast and on time. We were at London's King Cross within two hours. I spent the second hour talking to a very nice blonde New Zealander after I offered her a biscuit. I spent the next few hours running from shop to shop. First, the Body Shop. Afterward, I popped into Gay's the Word, and said hello to Jim, the manager. he always makes good recommendations. Unfortunately, he didn't remember me at all from my visit last year. So I had his acquaintence but he didn't have mine. No matter.... we had a lovely chat. Then, I was off to a store near Seven Dials, for work purposes. It was a quiet afternoon and they had time to entertain me. I was running late as per usual, so I tried in vain to find a working phone box in the Covent Garden section of London. There were only two I could find. One had a young woman perched within and she clearly wasn't going to leave. The other had two Japanese girls who were not on the phone at all. They were waiting for a call "in 20 minutes," so I harassed them into evacuating the phone box while I called my cousin N in Borehamwood in just under 50 seconds. Good old Thameslink... they never, ever come through to take a ticket. It's amazing they are making any money at all. I buy tickets from time to time, but why? Plus, when I get on in West Hampstead, there is no way to buy a ticket. I walked from the train station to my cousins' house. I was only a wee bit late. The children were wildly awake and vying for my attention. The youngest had had quite a day: Prince Phillip "officially opened" his school, which he'd been attending all year. Everyone in the family but M was allowed to go, as he was not a student at that school. Bloody Prince Phillip! Ruined things for both of us today. M is learning to ride a two-wheeler without "stabilisers" (training wheels), and D is very very very interested in all sorts of snakes. They went to the library today and took out a horrendous book that horrified their mother, N--Crime and Punishment through the Ages, or some such. Full of blood, gore, and torture. N drove me back to her parents'. We had a nice supper of chicken fillets with rice and peas and salad, and afterward, we took a good walk around Radlett. B and I watched an interesting doco on the origins of syphillis, originally blamed on the "New World," but then there was a pre-Columbian discoverey of syphillis damage to skeletons found where a monastery in Hull once stood. This was followed by the final episode of Stephen King's Storm of the Century, which was riveting yet awful. B cried out "What a cop out!" when it ended. Then I spent about two hours doing my packing up before retiring for the night.